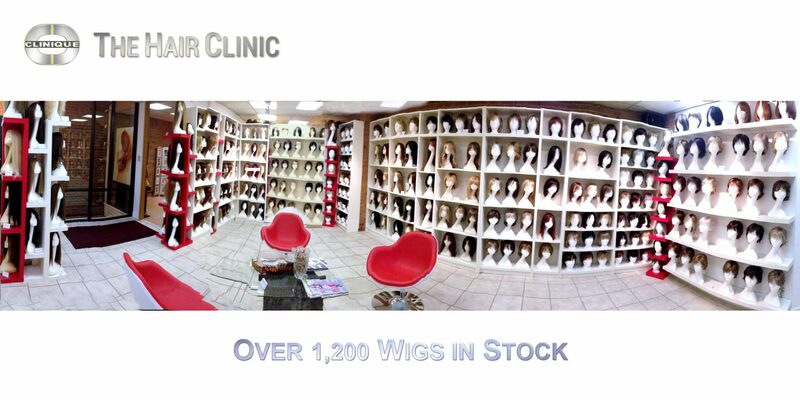 Located in the heart of downtown Montreal, The Wig Center at The Hair Clinic Wigs Montreal carries a staggering choice of over 1200 quality wigs, with 2500 square feet of space and 5 private styling rooms. All the wig models are in stock at all times, so when you find something that suits you perfectly, you can leave with it the same day! Take a walk through our beautiful showroom and be dazzled by the large variety of wigs. From blonde wigs to brown wigs, short wigs to long wigs, and curly wigs to silky straight wigs. Our wig shop carries over 40 shades of wig hair colors, as well as 2 tone wigs and 3 tone wig colors to satisfy the most discriminating tastes. You might even have trouble making up your mind, but luckily our experts are always on spot to advise you on the best wig color or fashion wig styles are best for you. You will never feel rushed or pressured at our wig store. We never hurry your choice, we know how important that is for you! You can always take as long as you need and come back as many times as you like. Choosing the best wig for you is a deeply personal decision, and we are here to support you all the way. Our premier Montreal wig shop carries a full line of fashionable, top quality wigs for every budget and preference in both human and synthetic hair available for your perusal. The Hair Clinic human hair wig depot offers you a choice of either Indian hair wigs or European hair wigs. Our wig store also carries synthetic hair wigs that’s soft and manageable. In the unlikely probability that you want a wig that The Hair Clinic Wigs Montreal doesn’t currently have in stock, it is always possible to order a custom wig in the color and style that will be made exactly according to your specifications. We believe that personal service and the ability to reach out and touch a wig and try it on trumps ordering online every time. Wigs are our trade and our pride, and we will stop at nothing to satisfy you, our valued customer. Hospitals and doctors regularly refer their patients to us, putting their trust in The Hair Clinic Wigs Montreal and our extensive choice of wigs and the sensitive, supportive environment. At The Hair Clinic Wigs Montreal, we offer a service that goes beyond the initial sale. Should your wig need an adjustment, just come back to see us and we’ll happily do it for you free of charge. If your new wig needs a cut, that’s included in the price as well. If ever your wig needs a wash or set and you feel uncomfortable doing it yourself, we’re there for you as well. State of the art technology has combined with the precision wig-making techniques to create the world’s finest hand-crafted wigs….. So natural looking we dared to name them Second Scalp Wigs. To emulate nature’s own design, each hair strand is individually inserted by hand into a patented silky sheer micro thin monofilament lace base, in a freestyle pattern. Single hair insertion makes each hair strand look as though it were growing from your scalp. Freestyle hair insertion yields unprecedented styling flexibility, allowing the hair to be parted anywhere and in any direction. The revolutionary front hairline of Second Scalp Wigs incorporates Translucent Dermalens Technology for virtually limitless hairstyles. Second Scalp wigs are made of soft stretchable materials for utmost comfort and a perfect fit, avoiding the pressure and irritation caused by ordinary wigs found in many Montreal wig shops. Second Scalp wigs are available in both 100% Human Indo-European Remy Hair, or state of the art Hairlon Synthetic Fibers. Second Scalp Wigs are Hand-crafted master hairpieces, found exclusively at The Hair Clinic Wigs Montreal. The Hair Clinic Wigs Montreal carries the largest selection of both human hair wigs and synthetic wigs, hand made wigs and machine made wigs. Our Wigs Montreal shop synthetic wigs are made of Hairlon synthetic fiber which rivals the best natural hair wigs. The Wigs Montreal Center’s human hair wigs are made with 100% Human Indo-European Remy Hair of the utmost quality. Hand-made wigs in our Wigs Montreal depot have a revolutionary sheer cap which lets your scalp show through for a completely natural looking wig. Each hair is hand knotted into the wig cap one hair at a time, allowing you to part the hair on your wig in any direction. Every hair looks like it’s truly growing out of your scalp, giving you the confidence you need to wear your hair with pride. Our Montreal wig shop machine made wigs are also high-quality hair prostheses which allow you to buy your wig on a budget. It’s important to buy a quality wig, even if you’re on a budget, since cheap wigs can result in headaches and may even promote hair loss. The Montreal wig stores quality prosthetic wigs are made to look as life-like as possible, with just the right amount of hair for every style. Our high-quality wigs have just the perfect hair density for a most natural look that has just enough volume to look absolutely great. Our Wigs Montreal shop offers you the best front lace wigs, utilizing virtually invisible materials such as the sheer Swiss lace front wig, the translucent French lace front wig, or the virtually invisible welded mono lace front wigs. Our Wigs Montreal center offers you several high quality wigs including front lace wigs, full lace wigs, mono top wigs, and full mono wigs with an ultra-natural front hairline. If you don’t want bangs, a lace front wig will offer you a most natural hairline. The front lace wig cap is made of a thin, sheer material called monofilament, into which each hair is grafted one-by-one. You can part your wig hair in any direction you choose for a totally natural appearance. Monofilament wigs are truly made to replicate hair growth pattern of human hair as closely as possible. It’s important to find a natural looking wig that fits you well and comfortably. A properly adjusted wig avoids discomfort. The Hair Clinic Montreal wigs are adjusted for a perfect fit and utmost comfort. Renowned for its ultimate quality and unparalleled service, The Hair Clinic’s Wigs Montreal store carries the largest selection of wigs in the Province of Quebec, at the absolute best price! The Hair Clinic’s Wig Center offers you a wide range of quality wigs, made with the latest technology and featuring both today’s most fashionable hairstyles as well as stunning classic hairstyles. Our Montreal wig shop carries the best wigs in every natural looking hair length imaginable. From short wigs, medium wigs, long hair wigs as well as extra long wigs, varying from 10 inch long hair to 24 inch long hair. Our quality hair comes in a variety of textures including curly hair wigs, wavy hair wigs, or silky straight hair wigs. Our silky human hair wigs can be styled in any way you like, so if you feel like going from a straight hair wig to a curly hair wig for an evening, that can be easily accomplished with a curling iron, just like with your own hair. Some of the hot wig styles we carry include bob cut wigs, flipped bob wigs, long bob wigs, Chinese bob wigs, long layered wigs, short layered wigs, medium layer wigs, long hair wigs, curly wigs, wavy wigs, pageboy wigs and pixie wigs; just to name a few. Our best wigs are also available with or without bangs. Each light-weight wig can be cut & styled to more perfectly emulate the hairstyle you’re looking for. The cut is done by our talented, expert stylists with many years of experience in wig styling and is included with the purchase of each high-quality wig. The pictures on your right are just a few of the fashion wigs available at our Montreal Wigs Shop. Each of the wig styles shown are available in a wide array of colors in 2 tone color wigs or 3 tone color wigs, with highlighted wigs and lowlighted wigs. No matter how specific your hair requirements might be, we will try to match your hair color and hair style with a closely matching wig colour and wig style. Hot hair is so cool, but so’s a $50 Discount Coupon on your first hand made wig at The Wig Center of The Hair Clinic Wigs Montreal on Crescent Street. At The Hair Clinic, we really can give you the hair of your dreams!